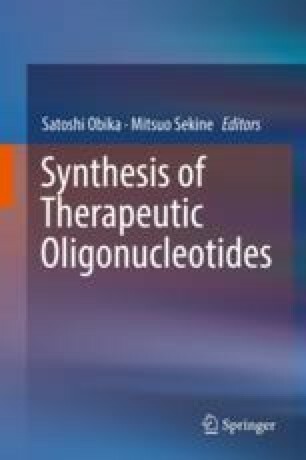 Much attention has been paid to the development of effective methods for synthesizing modified oligonucleotides that have various functional groups. Recently, we have developed a selective phosphorylation toward the hydroxyl group (O-selective phosphorylation), which is named as the proton-block method. An activated phosphite method was also developed to synthesize modified DNA oligonucleotides having alkaline-labile functional groups. The DNA synthesis using the activated phosphite method, which involves a phosphite intermediate generated from the phosphoramidite building block, presents excellent chemoselectivity toward the hydroxyl groups on resins under solid-phase conditions. In addition, the O-selectivity of the phosphorylation with P–N bond cleavage using 6-nitro-HOBt is more than 99% in the RNA synthesis without base protection. In this review, we summarize the O-selective phosphorylation in DNA and RNA synthesis without base protection and the synthesis of modified oligonucleotides having alkaline-labile functional groups using these new methods.